Help protect your corporate resources from unauthorized access utilizing Microsoft's Enterprise Mobility + Security Suite. It is the most cost-effective and fastest way you can deliver complete device and application management from the cloud, or on premise. Enterprise Mobility + Security is a well-executed solution for Bring Your Own Device (BYOD) and consumerization of IT issues. What Enterprise Mobility + Security Services are available from ABTechnologies? With the proliferation of mobile devices in the workplace, employees can connect and work from anywhere. To stay productive, this workforce demands continuous access to business resources and data from any location on any device. This Bring Your Own Device (BYOD) trend has introduced challenges for business owners who want to enable worker mobility while ensuring that corporate resources are protected from unauthorized access. 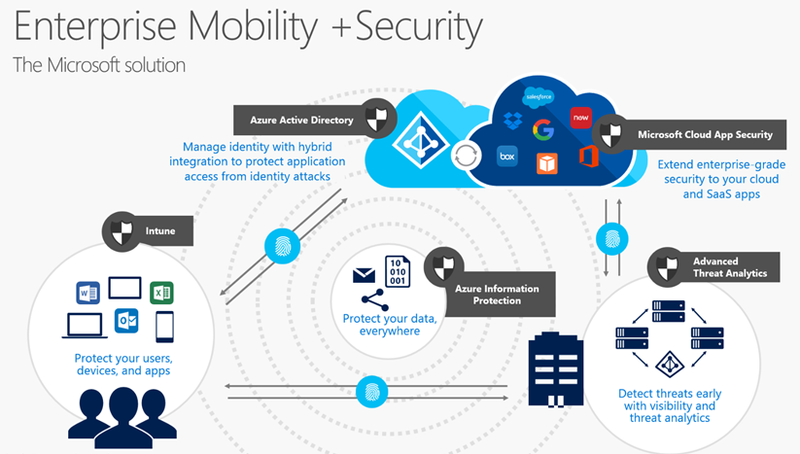 Azure Active Directory Premium delivers multi-factor authentication; access control based on device health, user location; and, holistic security reports, audits, and alerts. Microsoft Advanced Threat Analytics helps extend the visibility, auditing, and control you have on-premises to your cloud applications. Azure Information Protection provides persistent data protection of files shared internally and externally, including the option to track, classify and label data. Microsoft Cloud App Security provides deep visibility and control of data inside cloud applications. Microsoft Intune makes it easier to secure and manage iOS, Android, and Windows PCs all from one console. Deep integration with Office 365 helps keep company data secure in the Office mobile apps. Interested in Enterprise Mobility + Security?